Christopher Reeve's children have released the following statement via the Christopher & Dana Reeve Foundation on the death of Robin Williams. “The Reeve family, like many, will remember Robin for the humor, energy and brightness he brought into our lives through the screen. We will cherish him, though, for the quiet and unwavering support he showed our family through the hardest times. The world knew Robin as a comedic titan, but to our family, he was simply one of our Dad’s dearest friends. From the moment they were classmates at Juilliard, their friendship transformed into a brotherhood that was built on a mutual admiration for the theater, the arts and, most importantly, laughter. “After our father’s accident, Robin’s visit to his hospital room was the first time that Dad truly laughed. Dad later said, “My old friend had helped me know that somehow I was going to be okay.” Robin and his incredible family stayed by our side for the rest of Dad’s life, and long after that as well. He and Marsha Garces Williams joined the Board of the Reeve Foundation, and provided unending support without fanfare or question. Christopher Reeve and Robin Williams met as roommates while studying at Juilliard. While training side by side, their camaraderie on stage blossomed into a friendship that would remain steadfast through each chapter of their lives. Following Christopher’s accident, Robin stayed at his side and was a pillar of support for the entire family. “‘The world has lost a tremendous activist and artist, and an inspiration for people worldwide. 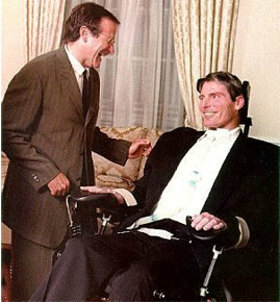 I have lost a great friend.’ Ten years ago, Robin Williams shared those words when Christopher Reeve passed away,” said Reeve Foundation President & CEO, Peter Wilderotter. "It is with a heavy heart that we announce the passing of a dear friend, former board member and advocate for our community. While the world knew Robin Williams as an Oscar-winning actor, we knew a different side to the man whose smile was as big as his heart. “To share a familiar and beloved story: When Christopher was first hospitalized, Robin Williams arrived in his room, dressed as a doctor, reprising his role from the movie Nine Months. ‘He announced that he was a proctologist and had to examine me immediately. For the first time since the accident, I laughed,’ as recounted by Christopher in his autobiography. “Without hesitation, Robin joined the Reeve Foundation Board of Directors and immediately assumed the role of advocate for our community. 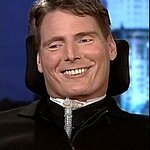 For his dedication and unwavering support, the Reeve Foundation honored Robin in 1998 at A Magical Evening with the inaugural “Human Spirit Award” and then recognized him again in 2007 at an event in Los Angeles Even his attendance at events resulted in a surge of supporters reaching out to contribute to the Reeve Foundation mission.